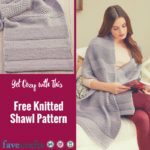 This past weekend the editors of FaveCrafts and AllFreeJewelryMaking had a blast touring the Bead&Button Show in Milwaukee, collected a new list of hot trends, and met some amazing designers we can’t wait to introduce you to! 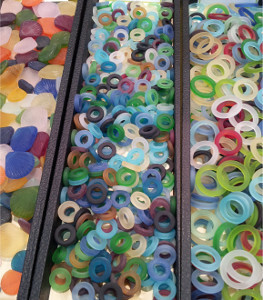 From the crazy color combinations to cute little animal beads to fabulous new products, The Bead and Button Show opened our eyes to what’s hot and happening this summer. 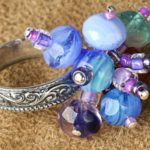 If you have never heard of the Bead&Button Show you’re in for a treat, and possibly a new annual tradition! 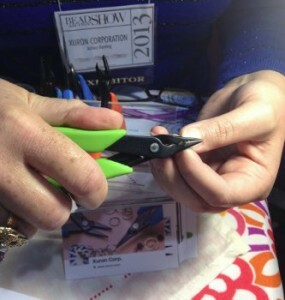 Located up North in Milwaukee, WI, the Bead and Button Show is the largest jewelry and bead show in the world, hosting over 300 talented designers and companies that are dedicated to the crafty world of beading (and buttoning)! 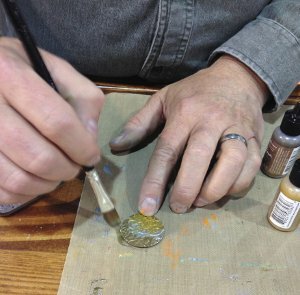 These designers and companies each have their own booths that display and sell their patterns, one-of-a-kind jewelry, and products–plus, some of the companies even hosted “Make and Takes!” The show will also hosts over 700 bead and jewelry classes. It doesn’t get more fun for beaders like us than being able to walk through a conference dedicate to tiny, shiny, beads and buttons! This year, bright colors are all the rage. From shades of sky blue and teal to fuchsia and coral, this summer, the bolder the better. We noticed a great focus on blue, teal, and turquoise which was complemented by an assortment of corals, reds, and oranges. 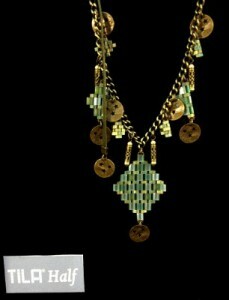 That being said, this summer the focus should clearly be on cheerful beads that add a POP of color to your outfit! 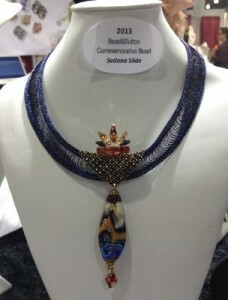 This year at Bead&Button, we noticed a hot selection of seed beads, rhinestones, and seas glass. 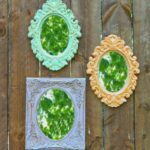 These top trends are great jewelry projects for beaders to work on during the summer–especially when it comes to sea glass! Using these different types of beads to create large statement necklaces was spotted at the show, which is another fun option for summer beaders. We met a lot of talented designers during our stay at Bead&Button, and no one knows the beading world like a designer! Take it from an expert like Hannah Rosner, spikes and skulls are back IN! 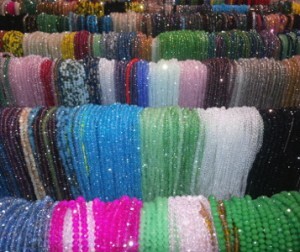 Also, those amazing double-holed seed beads are in high demand. Another really cool beading trend we saw was the increased popularity of dichroic glass beads, and Karen Bruns’ Designs had an amazing display of them. 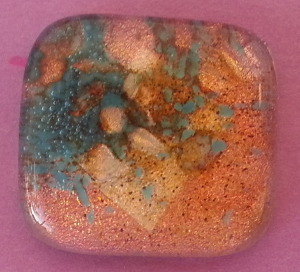 These glass beads undergoe a color change in certain lighting conditions, which is super-cool! 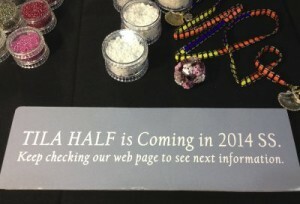 What’s your favorite trend from the 2014 Bead&Button Show? 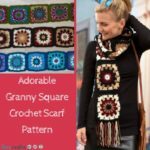 Bead&Button Show “Swag Bag” Giveaway Winner! 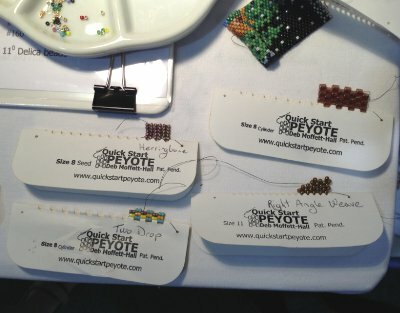 Last month, AllFreeJewelryMaking visited the 2013 Bead&Button Show to check out the latest in beading and jewelry-making trends and techniques, and we gathered up a whole bag full of goodies to share with our fabulous readers! Pam King! Pam said, “I LOVE ALL jewelry making techniques. My favorite is making cluster necklaces and bracelets. Still learning to make other things, and once I’ve learned, I’m sure there will be other favorites.” Congratulations, Pam! Thank you so much to all who participated in this contest; we appreciate your interest! 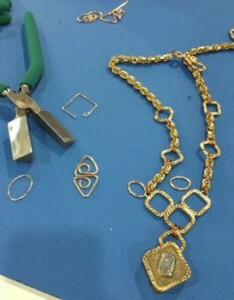 And don’t forget to check out our AllFreeJewelryMaking.com giveaways for even more chances to win! 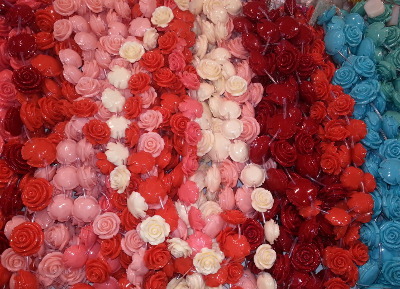 Bead&Button Show 2013 Recap + Swag Bag Giveaway! From loom weaving to chainmaille, wirework to lampwork, resin to clay, every jewelry-making medium and technique imaginable was represented on the the exhibitor floor at the 2013 Bead&Button Show. 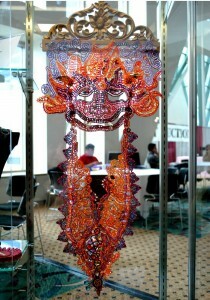 Held over the course of two weeks at the Delta Center in Milwaukee, Wisc., this year’s Bead&Button Show was another amazing event that drew jewelry designers, companies, hobbyists, and more from all across the country to talk beads, share techniques, and interact with others who share their jewelry-making passion. As the editor of AllFreeJewelryMaking.com, I wouldn’t have missed the show for all the seed beads in the world, and though I had just one day to attend, I managed to walk the entire show floor and see everything these amazingly savvy and passionate jewelry companies and designers had to offer. With camera in hand, I made my rounds of the Bead&Button 2013 show floor, taking note of the hot new products, trends, and tools, and I’m recapping it all here for you so that even if you weren’t able to attend, you can get up to speed on what’s new in the beading world right now. 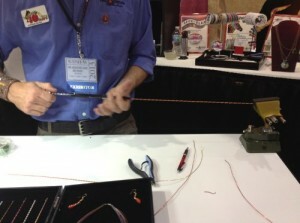 At the Fire Mountain Gems booth, I got to see these neat wire-twisting pliers in action. 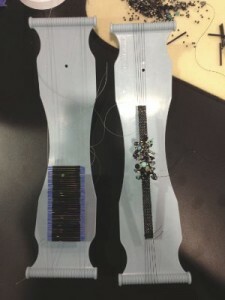 They allow you to twist two pieces of wire together for a surprisingly clean and uniform final result, and they’re much more accessible than using a drill. 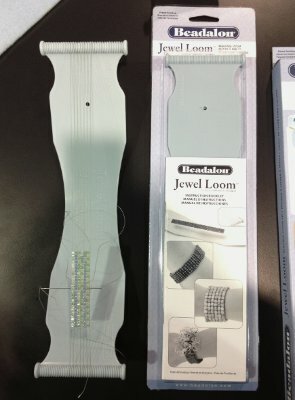 One of the most buzzed about products at the Bead&Button Show was the relatively new Jewel Loom by Julianna Hudgins for Beadalon. 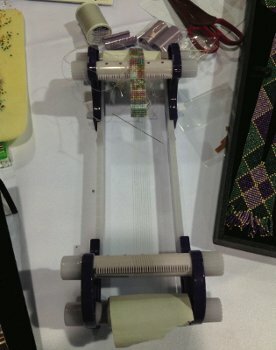 Easy to use, affordable, and transportable, the Jewel Loom makes loom beading more accessible than ever before. If you hoped to buy one on the floor, you were out of luck; by the time I got there, they were all sold out! Those looking for a more traditional loom option, however, would have been enamored of the Clover USA Beading Loom. Just look at the amazing pieces that were created with this durable and easy-to-use loom! One of my personal favorites was the Micro Engraver tool at the Beaducation booth. I’d never seen anything like it, and it was so easy to use! 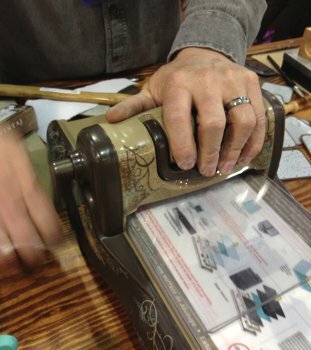 Like drawing with a pen, this neat tool is perfect for personalizing metal blanks. I got to have some fun playing with the Sizzix BIGkick roller machine at the Vintaj booth, embossing metal blanks and then painting them with the fun and colorful Vintaj-Ranger Patinas. 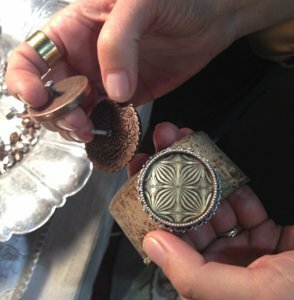 I couldn’t believe how fast the patinas dried; you could touch the blanks and sand them for a vintage look in a matter of a minute or two! In the Xuron booth, the hot new item was the 4-in-1 Bead Crimping Plier, which eliminates the need for multiple tools by including folding stations for 1mm, 2mm, and 3mm crimp beads. Plus, the ends are designed like chain nose pliers so you can give your crimps that extra squeeze for security. I’m always excited to see what’s new in the Nunn Design booth, and she certainly didn’t disappoint. The newest line has that same vintage elegance and industrial edge that we’ve come to expect from Nunn Design, but to the usual suspects she’s added bezel button shanks and interchangeable and screw-in bezels for customizing cuffs, among other new additions. 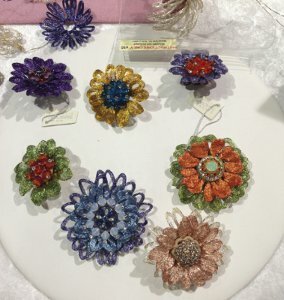 The Alacarte Clasps and WireLace booth was in full bloom with beautiful flowers made of WireLuxe, demonstrating even more ways that this luxurious knit wire product can be used. 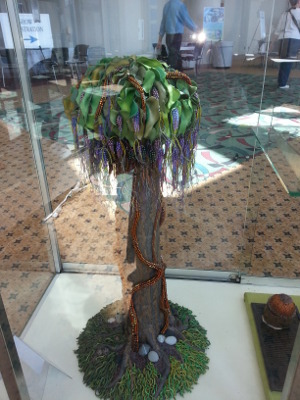 Plus, the Bead&Button Show 2013 commemorative bead was on display, hanging elegantly from a WireLuxe necklace. Stunning! 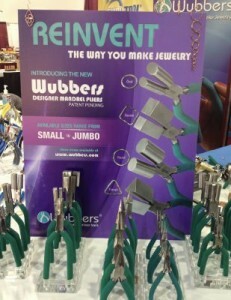 Wirework fans would have been drooling over the new Wubbers designer mandrel pliers. The range of tools offers the possibility to form wire jewelry into a variety of stunning shapes. A new exhibitor at Bead&Button Show, DeeBeads was demonstrating her new beadable rings. The grid-like design of the ring base provides a perfect foundation for all kinds of statement-making bead ring creations. 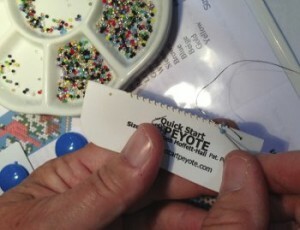 There was even something for beginner beaders at the show. These Quick Start Peyote Cards by Deb Moffett-Hall make it easy to start off your beading pattern, keeping your stitches straight and uniform. 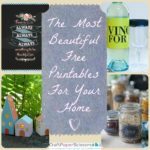 This doesn’t even begin to scratch the surface of all there was to see at the Bead&Button Show; it’s truly a must-make trip for all beading enthusiasts! But if you weren’t able to make it this year, you’re in luck! We collected some free “swag” at the show that we’re giving away to one lucky reader. 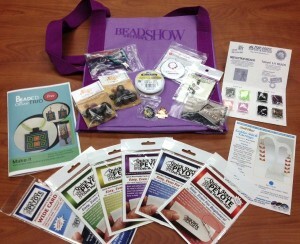 Enter our Bead&Button Show Swag Bag Giveaway for your chance to win a whole bag full of free goodies from the show. This sampling of jewelry-making “swag” will make you feel like you were right there with us! The Bead&Button Show Swag Bag prize pack includes a large Bead&Button Show tote bag, an assortment of Quick Start Peyote beading cards, a seed bead sample pack from Toho Beads, Color Me Beads from the Urban Beader, Vintaj Arte Metal chain, Beadalon bead stringing wire, Teeny-Tiny Wubbers round nose pliers, a free bead loom pattern from Clover USA, a free earring pattern from Soft Flex, a Bead&Button Show 2013 commemorative pin, and more! Want to win this amazing collection of jewelry-making products? Simply leave a comment on this blog post answering our question below and be entered to win! You have until July 2nd, 2013, to enter, so comment now to ensure you’re in the running to win this exclusive one-of-a-kind “swag bag” from the Bead&Button Show! Contest closes July 2nd at 11:59p CST. 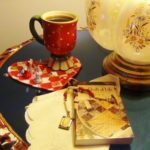 Leave a comment on this blog post answering the question below to be entered to win. 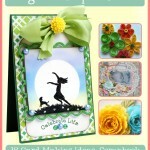 Winners will be posted on FaveCraftsBlog.com and notified by e-mail. 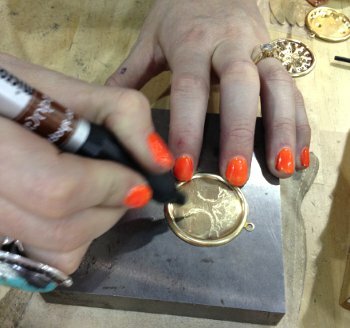 What is your favorite jewelry-making technique? I know I’ve been keeping you in suspense, but I swear that was not my intention. Now without further ado, a sneak peek inside the show for those of you that didn’t go and a little trip down memory lane for those of you that were. 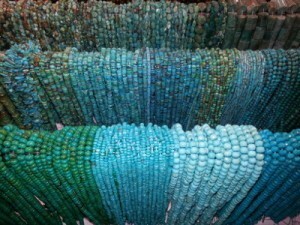 These gorgeous beads were on display thanks to Antelope Beads and the lovely Laura Bittner. This incredibly life-like necklace was showcased by North Fire Designs. Beads, beads, beads, and more beads! These shots are just a taste of what I was looking at. There were all sorts of colors, shapes, and textures. It was extremely pleasing to my senses. But wait! We also had…. 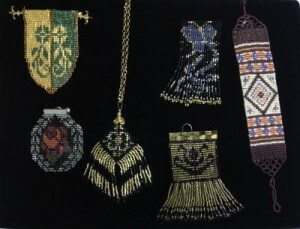 …beaded beads! That’s always fun to say. 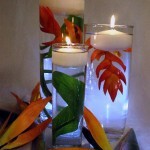 These were incredibly beautiful and well done. 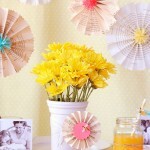 If only I knew how to make these for myself. And I’ll end on this little guy who was made by yours truly! Isn’t he cute? And I made him all by myself, well, alright maybe the wonderful people at Vintaj helped me out with their super easy to handle embossing machine. But I did pick out the design and riveted that little flower in place. Aren’t you proud? Well that was it. I would have had more pictures if it wasn’t so hard to concentrate with all the beads around. All in all I think it was a very successful trip for AllFreeBeadedJewelry.com and hopefully you’ll be able to see some projects from these lovely sellers up on the site soon! 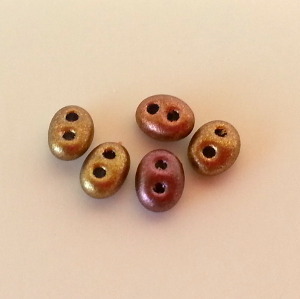 Have you made anything new with your beads? For those of you who read my teaser post earlier last week, your wait is over! This past Friday I spent the day on behalf of AllFreeBeadedJewelry.com looking at beads, talking to amazingly talented artists, and trying not to come home with everything in sight (although I’m not going to lie and say I didn’t by anything). It was a blast. I had such a good time talking to people and seeing all the wonderful things they were making. However, it did put me in my place with my extremely inadequate jewelry making skills. All I wanted to do when I got home was practice decreasing peyote stitches and stamping metal (instead I made an embroidery floss necklace). This re-cap post is going to mostly consist of pictures and actually be a two-parter, as uploading and editing photos takes waaaaaaay longer than it should. Anyway here’s the first half! 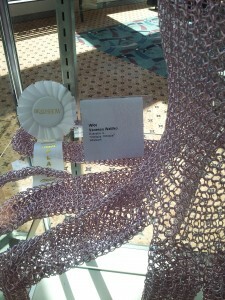 The outside registration area housed some amazing contest winning pieces, that I could only sit back and admire. This mask is incredibly detailed up-close. I didn’t want to use up all of the memory space on my camera taking pictures of it, but I could have. 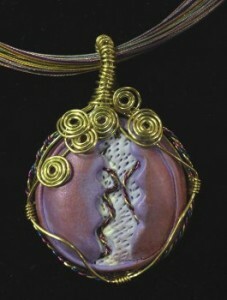 This piece was done by a Ukrainian bead designer, apparently a first for Ukraine. Would you be couragous enough to wear this little number? Designed by Blue Buddha Boutique‘s Kat Wisiewski. I love this one. How regal. Can you imagine wearing this out with a long black maxi dress. You wouldn’t be able to help feeling like an Egyptian goddess! Flowers seem to be ever popular in beading. This one is for all of you Lewis Carroll fans, yes it is an Alice in Wonderland themed necklace. And beautifully done too. As it was my first Bead&Button show, I was a little bit overwhelmed when I first set foot in the giant room housing all of the vendors. And although I tried, my attempts at capturing it in it’s entirety failed. I did take some pictures of the hustle and bustle. The seed beads were the first thing I saw when I entered the show floor and you can believe me when I say there was every color you can imagine in every size you could ever need. And yes I did pick up a few colors that I had been having some trouble finding (no trouble finding them here). I probably looked as enthralled as these women did too. That’s all for the picture post for today. Keep checking back for the upcoming post with lots of snapshots of the inside of the show. I can’t wait to see what you guys have to say about it!